When the 2010 World Cup was at its peak, we all heard a barrage of Vuvuzelas and, like most of the world, we asked ourselves "Why, God, why?" So, now we take a look at all the weirdest sports rituals from around the world and how they've affected their respective games. Here are the most bizarre sports rituals from around the world. The strangest and arguably the most disgusting sports ritual comes from New York Mets outfielder Moises Alou. Most baseball players wear batting gloves to absorb or minimize some of the shock on the hands when making contact with the ball and to improve their grip on the bat, but outfielder Alou is one of the few players in MLB who doesn't wear batting gloves at the plate. Instead of using batting gloves Alou uses a more "natural" method of urinating on the palms of his hands throughout the season in order to harden their hands and prevent against calluses. Alou claims that by urinating on his hands it helps his grip on the bat and helps to harden them. The trick may be more gross than helpful, though. A 2004 article in Slate questioned the value of this superstition since urine contains urea, a key ingredient in moisturizers that actually soften the skin. 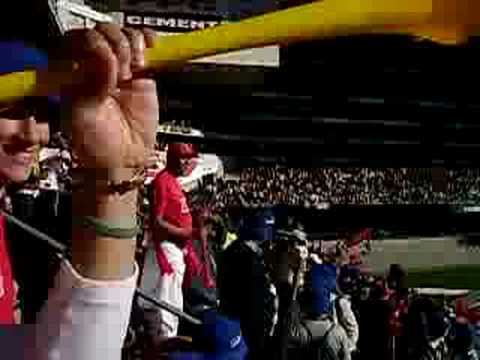 The Vuvuzela is a now world famous blow horn that was originally made of tin, but is now mass-produced in plastic for soccer games. Like blowing into the mouth of a trumpet, the Vuvuzela emits a loud monotone similar to elephant trumpets seemingly indiscriminate of what's actually going on during the game . Many tried to ban these noisemakers during 2010 World Cup because of all the complaints that they were too loud and not fit for a sports arena (or humanity's televisions, all over the world — especially people watching the game in surround sound). The vuvuzela supporters say that it doesn’t detract from the game and that it is a strong part of the South African culture. A practice that remains strong for the Detroit Redwings of the NHL is the tossing of octopi onto the ice after the Red Wings score a goal during a home game. Click here for a video explanation of how/why. The origins of this tentacled tradition began in 1952 when fewer NHL teams meant that the road to the Stanley Cup only took eight playoff wins. Thus, the eight legs on an octopus would symbolize the road to the Stanley cup with eight winning games. Since then, hundreds of octopi have rained down onto the Redwing rink. With every octopus purchased for the purpose of tossing, the Superior Fish Market gives out an "Octoquette," which is a pamphlet of recommended guidelines for octopus tossing, including boiling the octopus for half an hour (raw octopus tends to stick to the ice and leave a slimy residue when removed), launching them only after a Redwing goal as any other time may result in a Delay of Game penalty, and tossing the octopus in a direction away from any players, officials, and personnel. The All Blacks, the international rugby team of New Zealand, do a traditional Māori Haka dance before international matches and it might seem weird to some people, but it sure is intimidating. At the very least as a scare tactic, why more sports teams don't do this is a complete mystery. The team, made up mostly of Māori players, performed a Haka before the first match against Surrey. One version of the Haka is both war chant and challenge and is customarily performed by the All Blacks before major games against non-New Zealand teams. The dance, as you can imagine, consists of loud chanting, aggressive flailing of arms and stomping of feet, fierce looks and, in the end, an angry sticking out of tongues. The dance was supposed to be done in traditional Māori garb, but the costumes were discarded in favor of their uniforms.